Oil Painting Medic: I’m Confused about Oil Painting Mediums, What are they For? I’m Confused about Oil Painting Mediums, What are they For? Cold pressed oil, thickened oil, drying oil, refined oil, stand oil, poppy oil, linseed oil, safflower oil. What are they all for? It would appear that an array of oil mediums is needed for oil painting, not to mention alkyds (covered in another article). Does the artist really need all these oil mediums? 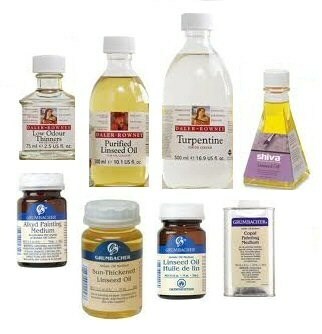 Find a list of oil mediums and what they are for below. Although great oil paintings are possible without such oils, it helps to know what they are for. The artist can then make informed decisions on what medium to use to attain certain effects. Separate articles have been dedicated to alkyd mediums and watermixable mediums for oils. Oils and solvents alter the properties of oil paint to serve a particular purpose. Linseed oil is the carrier of oil paint anyway, and by adding more will make the paint more translucent and runny, a bit like adding water to watercolor. This is why linseed oil is the most commonly-used medium that artists use for oil colors. Linseed oil has been extracted from the linseed (or flaxseed) for its excellent binding powers to the ground pigment. Solvents such as artist’s spirits or turpenoid serve to clean the brushes and add flow. But unlike linseed oil, will not add gloss. In fact, the paint will dry more rapidly to a ‘chalky’ consistency if mixed with too much solvent. Linseed oil can be mixed with artist solvent to counter this problem and create a good, all purpose thinning agent for oil paint. But for informative purposes, beginning with the drying oils, here is a rundown of all the oil mediums on the market and how they alter the properties of the oil paint. All drying oils have various things in common. Firstly, they accelerate the normal drying time of the oil paint. They also add gloss, flow and transparency, ideal for glazing techniques and detailed work. Find more detailed explanations below. This drying oil has the most rapid drying rate of all the drying oils. Extracted from the linseed, this oil increases transparency and flow to the paint as well as add gloss. It dries a little darker in color than ordinary linseed oil and therefore is unsuitable for pale colors. Again, this oil speeds drying time of the oil paint. It improves flow and adds gloss but is paler in color and syrupy in consistency, probably not ideal for intricate detail. It improves durability of the paint film. It behaves similar to ‘linseed stand oil’ (see further down this article) but dries quicker and a little darker. A fast drying, pale oil from the poppy seed. This oil increases gloss and transparency. As it is non-yellowing, it can be used with pale colors. Poppy oil is often used as the carrier for pale colors such as titanium white as it is non-yellowing. The artist can purchase art mediums with a faster drying rate than the ‘drying oils’ just mentioned, in the form of alkyd mediums (in another article). Alkyd mediums or ‘liquins’ are oils treated with alcohol and an acid (hence, ‘alkyd’) which is rather like a resin. Alkyds will half the drying time of traditional oils, so an oil painting that normally dries in 6 – 12 days will become touch-dry in 3 – 6 days with the addition of an alkyd medium - much faster than with a drying oil. 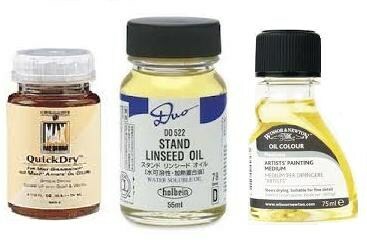 The following oil mediums will retard the drying rate of an oil painting, which will keep the paint workable for longer. This is ideal for blending and deliberating over an oil painting for a period of days. Again, these oils will increase transparency, gloss and flow to the paint. This oil is extracted from the linseed without the use of heat, making it higher quality. It retards the drying time of oil paint, but dries a little faster than refined linseed oil (extracted by the use of heat.) This paint increases flow and gloss. An ideal oil in which to grind pigments, it has a slightly yellowy appearance. This is the most popular oil medium that artists use. This oil dries more slowly than its cold pressed counterpart, as it has been extracted from the seed by the use of heat. It is paler in color due to being bleached and is lighter in texture, but still tends to yellow slightly with age. When added to the paint, it adds gloss, transparency and flow. But as it has low viscosity, it would be ideal for high detail. This is a pale, viscous oil that slows the drying time of oil and resists yellowing. It leaves a tough, smooth enamel finish and reduces brushmarks. But this oil would not be ideal for use with pale colors, as it dries slightly yellowish. A slow drying, pale oil from the safflower seed. It increases gloss and transparency and resists yellowing. This oil is the carrier for white pigments such as titanium and flake white and is therefore ideal for pale colors in a painting. Less often used that linseed oil, walnut oil has similar properties to linseed oil in that it can be used to thin the paint, add translucency and gloss, but dries a little more slowly and is more resistant to yellowing. The oil paint manufacturers, M Graham use walnut oil to bind the pigments instead of linseed oil. This makes the paint more free-flowing and slower to dry, ideal for glazing and blending techniques. Oil spike of lavender is an oily medium that has been distilled from the male lavender plant, but with a strong solvent for applying glazes with a runny consistency. This oil has a strong lavender smell that some might find too much, but its solvency power exceeds artist’s solvent. Use in moderation. A slow-drying gloss medium for fine detail, glazing and for eliminating brushmarks during painting. Painting medium is resistant to yellowing and is mostly used for oiling out (explained below). A good all purpose medium. Any artist oil can be used for oiling out, but most often it will be refined linseed oil or painting medium. Oiling out is a means of renourishing the oil in the paint that has dried dull. This might be due to using too much solvent in the paint, or the oil content being sucked into an absorbent art surface beneath. The most likely culprit is an art surface that has not been sealed properly, or if a cheap primer has been used. Once the oil paint has dried (allow at least three months if the paint layer is thick), apply a little of the oil via a clean rag onto the dull patches. This will eliminate dry, dull patches. Varnishing the painting will further bring out the colors’ saturation. Incidentally, never use varnish as a painting medium. And never mix varnish with an oil medium. The varnish has been designed for varnishing only, not an oil medium. Which Oil Medium Should I Use for My Painting? There is an array of oil mediums to confuse the artist. ‘drying oils’ will speed up the oil paints’ drying time; the other oils will slow it down. Some oils have a yellowy appearance and others are syrupy. Safflower oil, poppy oil and walnut oil are resistant to yellowing and are therefore suitable for pale colors. All oils will add gloss, transpaceny and flow and any can be blended with an artist solvent. The artist could get by with just linseed oil and an art solvent, but it is worth experimenting with other mediums to discover preferences. Thanks for writing about mediums in detail. There are very few journals that talk about the use of these mediums and their effects. Found this blog very useful. Yes, Thank you ! Great info.